In the midst of setting up their undersea headquarters, Aquaman &amp; Aqualad are suddenly beset by strange occurrences. The culprit is revealed to be Quisp, a self-described Water Sprite, from a secret sea beneath the ocean. Quisp has come to warn Aquaman of an impending peril to his world. A trio of colossal Fire Trolls have broken free of a volcano, through a fissure in Quisps world. The fissure extends into Aquaman s world , as well. No sooner has Quisp explained the threat, when the Fire Trolls emerge. 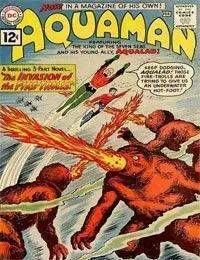 Aquaman, Aqualad &amp; a pod of sperm whales rush to engage the Fire Trolls, but are unable to slow their ascension to the surface. Racing ahead on dolphin back, Aquaman, Aquald, &amp; Quisp reach the Fire Trolls destination first., a jungle island, housing a U.S. army missile base, still under construction. A pitched battle ensues, with Aquaman joining the military forces in, unsuccessfully, trying to repel the invading Fire Trolls. Aquaman rationalizes that intense cold may be the downfall for the Fire Trolls, &amp; with Quisps help, races to the mainland atop a great waterspout, to retrieve the necessary chemicals.